Digital transformation is accelerating as more and more enterprises work to create and innovate by taking advantage of cloud. Research shows that in the near future, over 90% of enterprises plan to use hybrid, multi-cloud architectures to provide the type of cost, effective, flexibility and scalability needed by today’s digital transformation initiatives. Providing your customers choice between clouds can be a nightmare if you don’t have the right tools to stay in control. This is where VMware’s multi-cloud strategy comes in place. 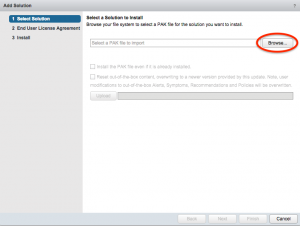 VMware’s vRealize Suite gives you a common toolset to manage and control both private as public cloud. With the new Blue Medora Microsoft Azure Management Pack, IT organizations now have the ability to monitor health and performance of Azure workloads using vRealize Operations, while they already had the opportunity to deploy and manage workloads in Azure using vRealize Automation and get insight in Azure costs using vRealize Business for Cloud. So, what does this Azure Management Pack do? 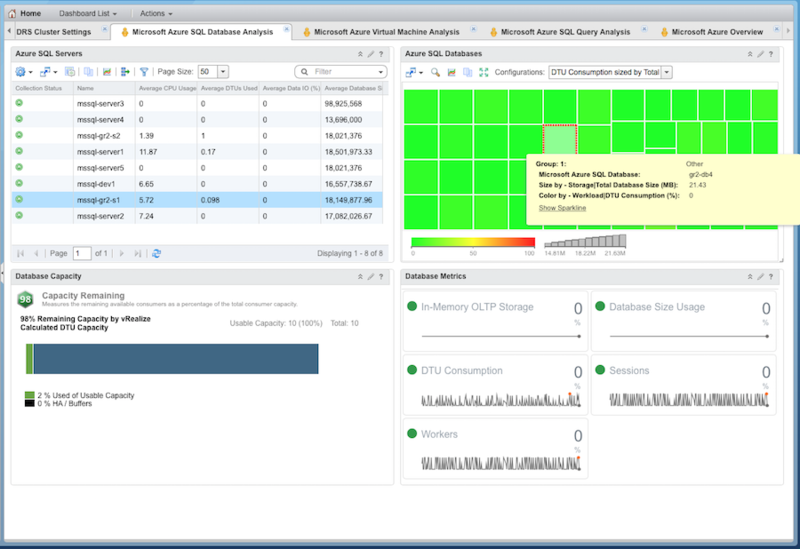 The Blue Medora VMware vRealize Operations Management Pack for Microsoft Azure collects performance data from Azure Compute and SQL environments and provides predictive analysis and real-time information about problems in your Azure cloud infrastructure. Microsoft Azure SQL Database Analysis. Microsoft Azure SQL Query Analysis. Microsoft Azure Virtual Machine Analysis. 200+ collected metrics for Azure resources. 20+ detailed alerts and recommendations. How do you install the Azure Management Pack? 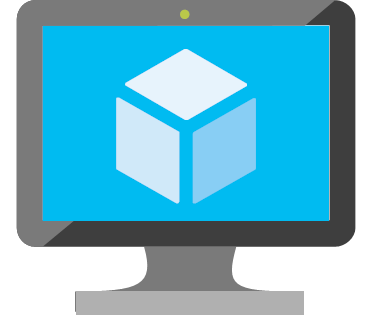 *The Management Pack for Microsoft Azure is part of Blue Medora’s Enterprise True Visibility Suite (TVS), which means a TVS Enterprise license is required to use it. Download the .pak file and save it to a temporary directory. 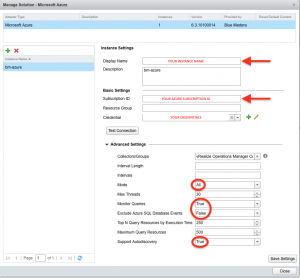 Log in to vRealize Operations, click on the Administration button and select Solutions. 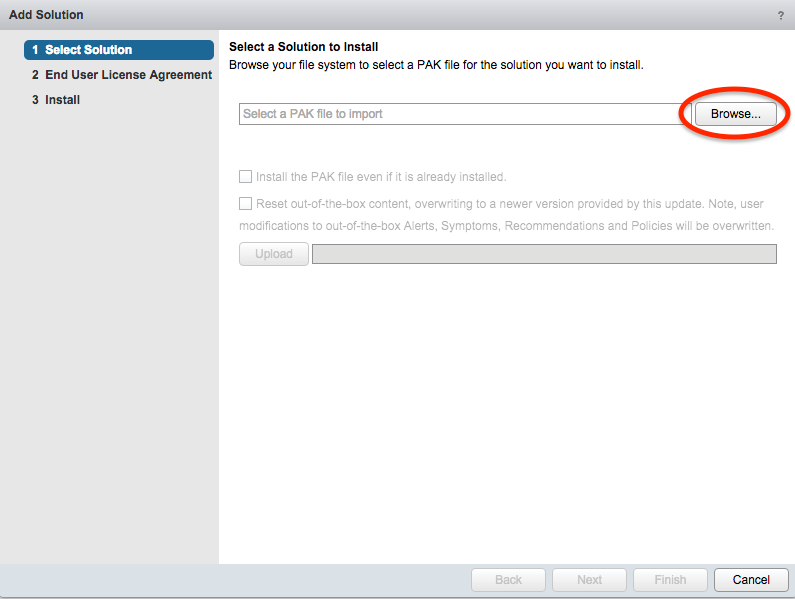 Click the Add button and install the .pak file. When the upload is ready, click Next, accept the EULA, click Next and Finish. Grab your license, go to Administration and navigate to Licensing -> License keys. Click the Add button, select Azure solution and enter your Blue Medora license key. 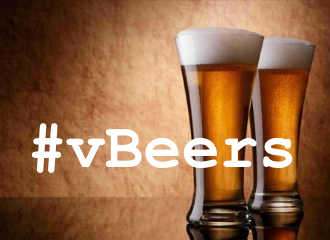 Click on Validate, if successful click Save. First you have to create your credentials. Log in to vRealize Operations, click on the Administration button and select Credentials. Click the Add button and select the appropriate credential you want to add, just an Azure Subscription credential or an Azure Subscription & SQL Database credential. You now have to create and configure an Azure adapter instance. 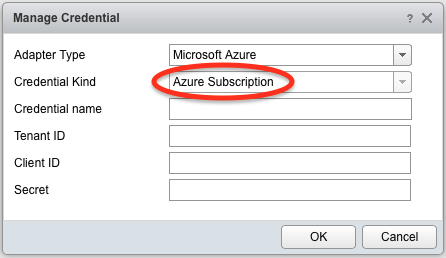 Go back to Administration, click on Solutions and select Microsoft Azure from the Solutions list. Mode: Used to specify the desired monitoring mode: All (default; monitors both Azure Compute and Database resources), Compute, or Database. Monitor Queries: Default value is False. Set to True if you want Azure SQL Database queries to be monitored. 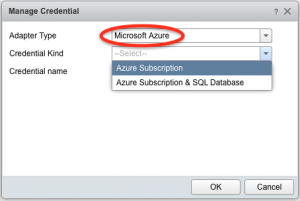 Exclude Azure SQL Database Events: Default value is False. 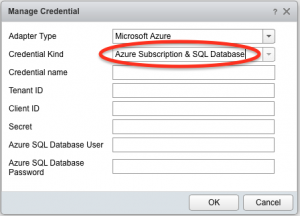 Set to True if you do not want Azure SQL Database events returned as part of the data collection. Leave the rest default for now. 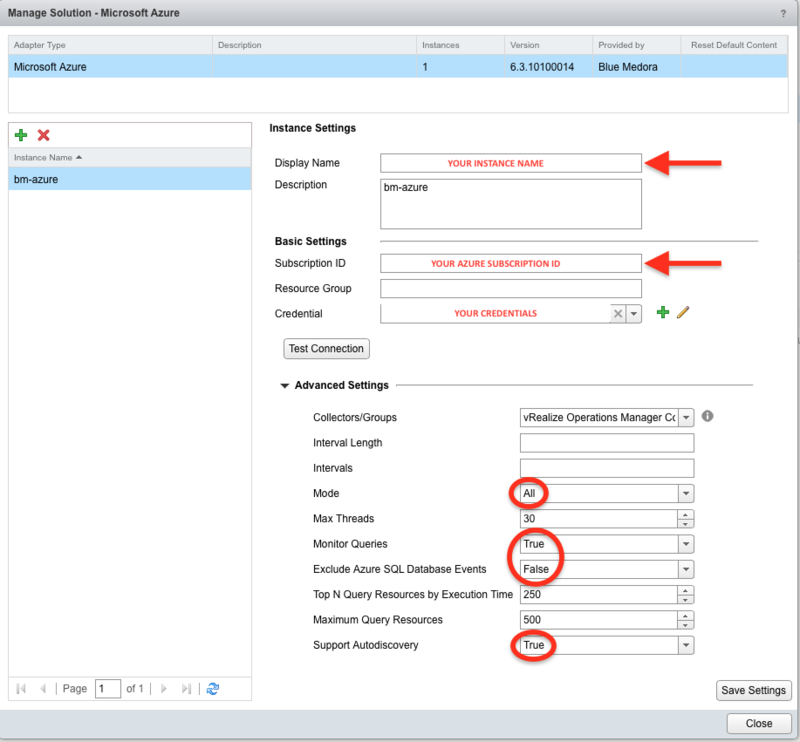 If you enabled Auto discovery for the adapter instance (default), it will create resources as soon as it begins collecting metrics. You can validate this by going to Environment, select All Objects under Inventory Trees, then expand Microsoft Azure. Select a resource and click the All Metrics tab to select metrics and validate values against the data source. 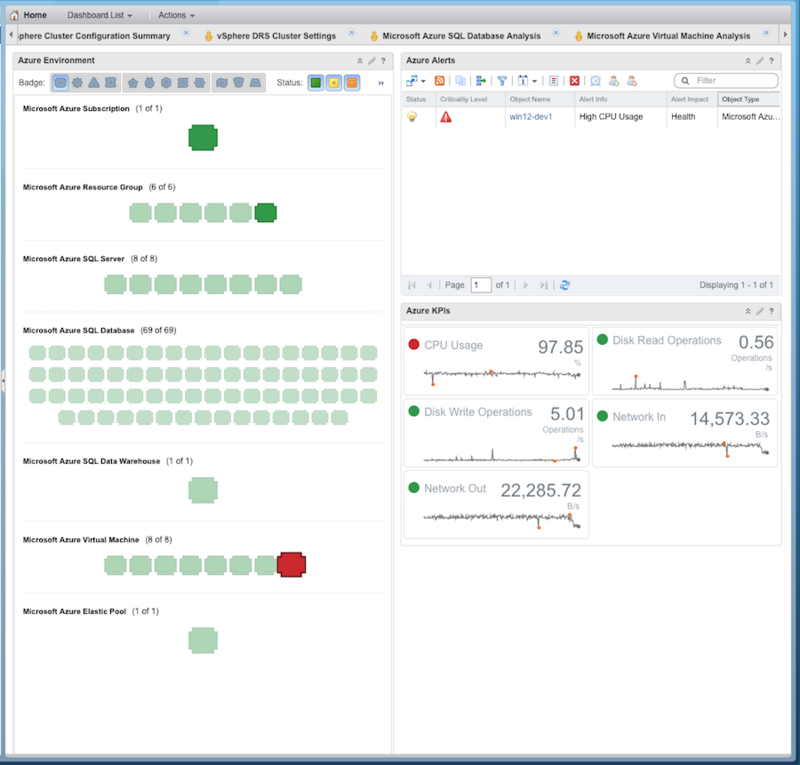 Dashboards are the primary feature for monitoring and troubleshooting problems from within vRealize Operations. The Microsoft Azure Management Pack provides 4 key dashboards. The Microsoft Azure Overview dashboard displays health status, at-a-glance, of all resources in your Microsoft Azure environment. By clicking on the colored badge icon for a resource on the left, you can investigate the selected resource’s alerts and KPIs displayed on the right. 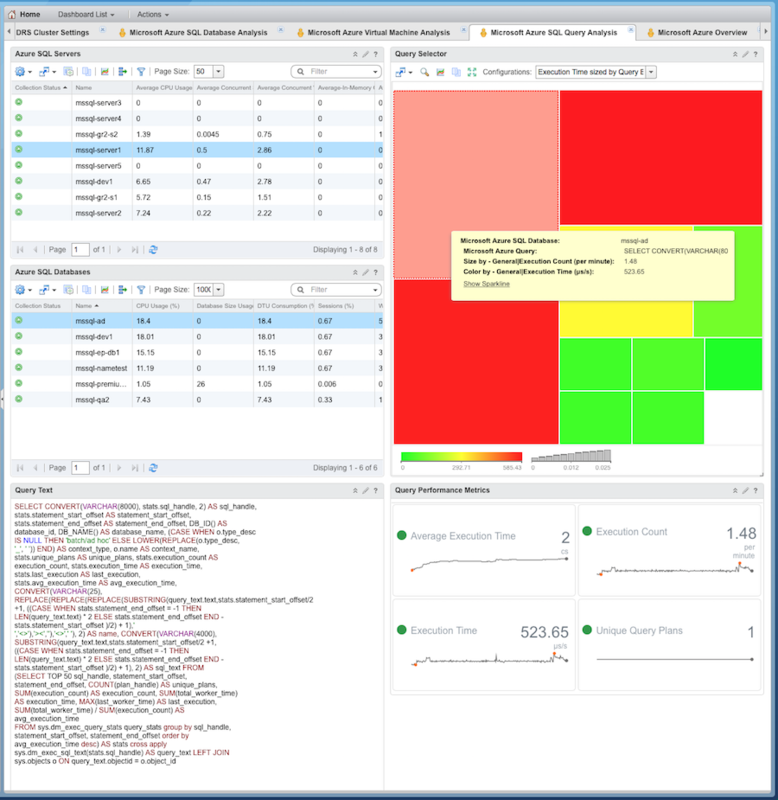 The Microsoft Azure SQL Database Analysis dashboard allows you to select a SQL Server resource, and any database located on that server from the heatmap widget, to view the selected database’s metrics and capacity. 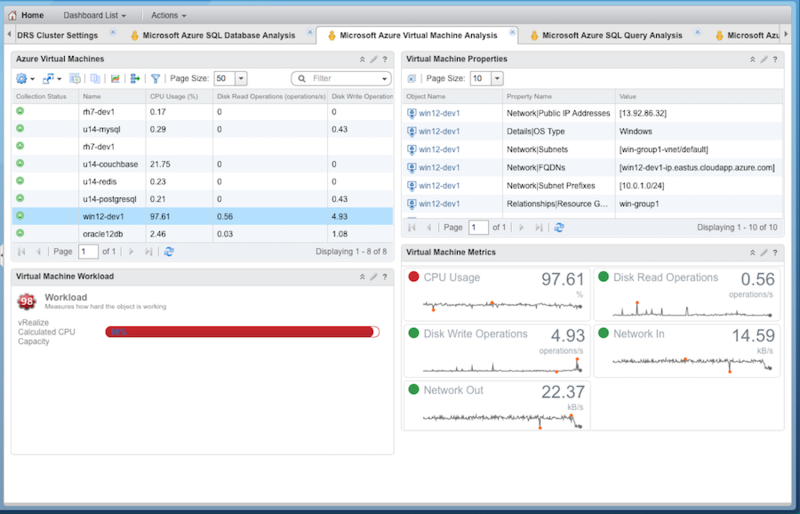 The Microsoft Azure Query Analysis dashboard allows you to drill down into problems with specific queries. By selecting a particular Azure SQL server and SQL database, all queries for the selected database will populate in the heatmap widget, and you can select any queries needing attention to investigate the actual query syntax and performance metrics. The Microsoft Azure Virtual Machine Analysis dashboard provides detailed properties, metrics, and workload capacity for a selected Azure virtual machine. Besides these dashboards, the Management Pack also provides additional Azure Views, Reports and Alerts. In my opinion, this Management Pack is a great addition to VMware’s Cloud Management platform and provides choice for enterprises to become a real cloud broker.